Ideal for a digestive stroll with your guests in less than 2 hours, the promenade of the lake front in the world of marshes, the path along the ponds channel is available in all seasons to discover the heritage of your Medoc lakes . To delve into family or friends in the world of marshes, the channel path offers a perfect setting! To discover that your guests during the digestive walk on Sunday afternoon? 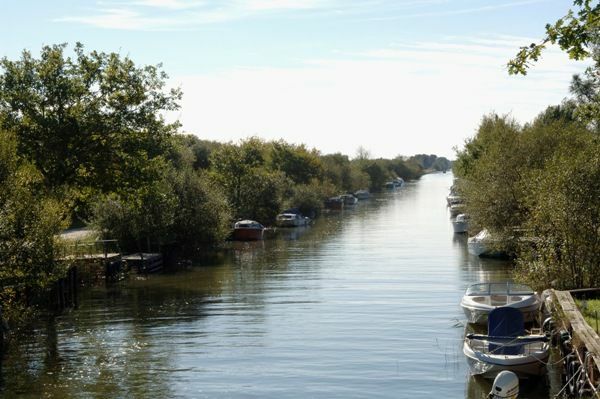 Look no further, this 8 km from the Pole instead Carcans Maubuisson (opposite the Tourist Office) traveled by 1:45 delight your friends with the discovery marshes, canals built to drain the lock and the Montaut. It is equipped with an automated sluice boat ... with a little luck the boat arrives borrow under your eyes, leaving you his clever mechanism, for the rest, difficult to imagine that the water flow running under our eyes, join the Arcachon basin where you were yesterday, enjoying a basket of oysters, to enrich it in fresh water. In few kilometers near the village and starting with the walk of the lake front, landscaped path that is accessible in all seasons (We still think to put on winter boots!) Suddenly offers an immersion into the atmosphere of marshes Médoc. Since the way ducks resting on the water zone are probably mallard or teal, and the hut hidden from their view is a ton of hunting. Hunting ton being an ancient and popular activity, popular on the shores of lakes and marshes. Look up the raptor spinning above your heads is a black kite or if you are lucky, the distinction of his white body let discover the elegance of osprey coming to feed on the marsh. For those who prefer to have feet on the ground, looking down, pay attention to the traces that lie beneath your feet, otters are very friantes crayfish shells which ones they have tasted here littering the dark sand of the road . Your laces are tightened? Then go! There is no review about Du Lac, Cap Sur Les Marais Avec Le Sentier Des Canaux !, be the first to leave one !